This is our fourth and last Li-Qua-Che project. 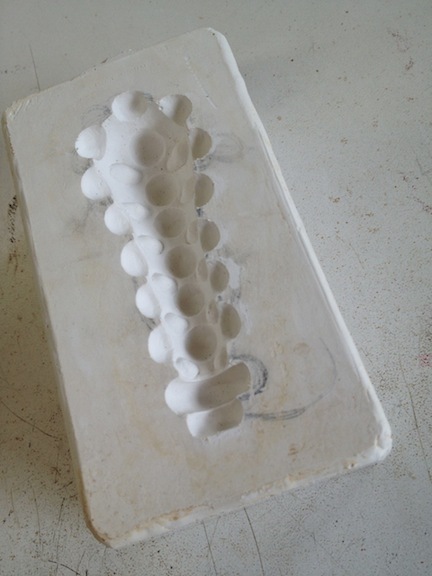 This time we are creating a small one piece mold that will be used to cast both sides of an object. 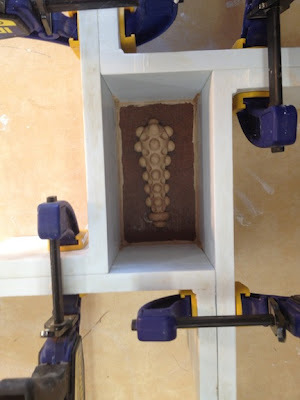 The photo above shows the oil clay model of a 4" nubby club just before pouring on the plaster. The nubby club is framed by plastic retaining walls to create a form to pour the plaster into. 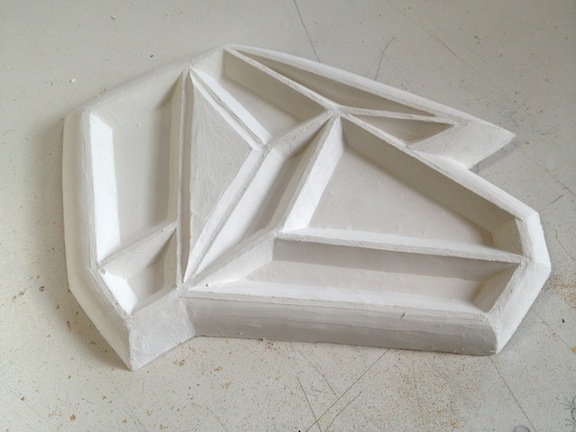 The model and walls are lightly sprayed with PAM as a release agent. Here is the plaster mold after hardening. 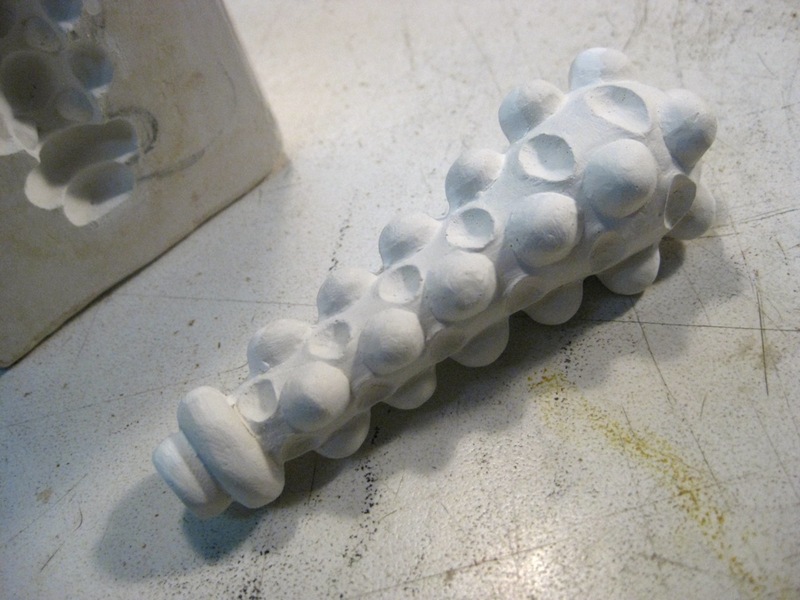 It still has the oil clay club in place which came out easily with the help of a pick to grab the oil clay and lift it out. The mold is cleaned with a little naphtha to remove any oil residue. Now is also the time to clean the mold of any surface anomalies. The mold is filled with Li-Qua-Che. 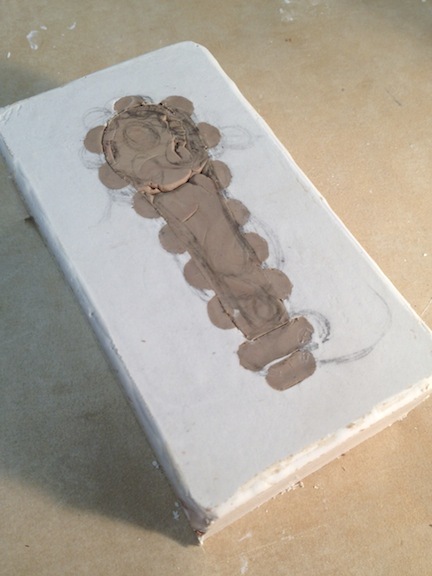 After waiting 5 minutes the Li-Qua-Che is poured out leaving behind a 1/8" leather hard layer of Li-Qua-Che in the mold. In the photo you can see the Li-Qua-Che shell is pulling away from the plaster walls as it dries and shrinks. 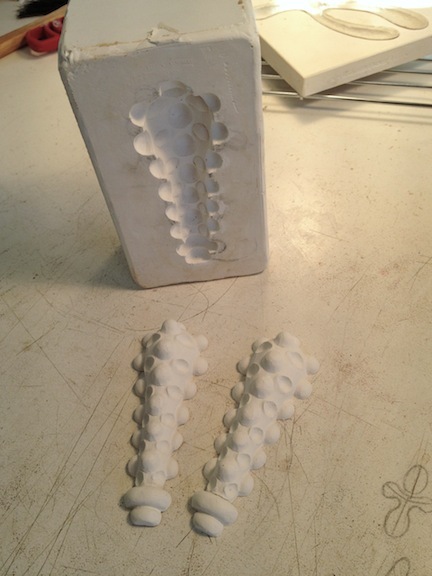 Here are the two cast sides pulled from the same mold. In theory these two sides should fit together perfectly. But due to the shrinkage ratio of the Li-Qua-Che, the edges shrink back more than the surface areas. This creates edges that are thin, pointy and uneven. Keep that in mind when building your model. 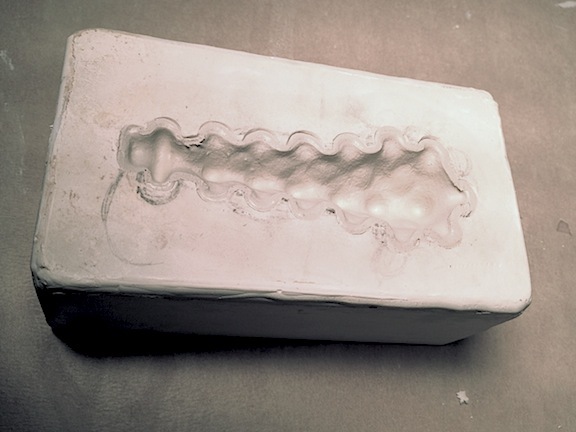 All edges need to be extended so that in the edges of the finished casting can be sanded back to create smooth even joins. So, here is the nubby club glued together and the seams filled with spackle. 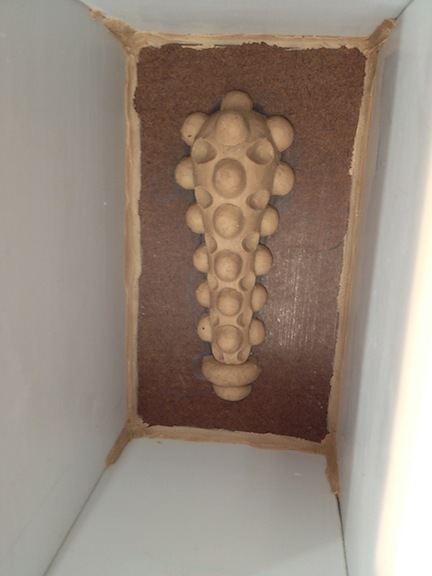 Note that the surface shows finger prints and boogers found on the original oil clay model. If you don't clean up the model and/or clean the surface of the mold, you'll be cleaning those finger prints and boogers off every casting. Well, That concludes our week of playing with Li-Qua-Che. 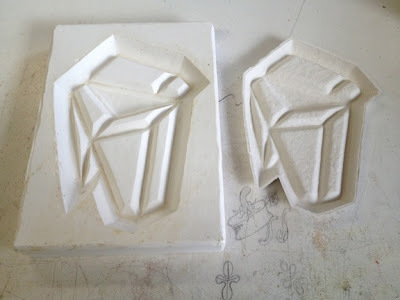 I haven't even touched our projects that used two part molds. But I think that's more than enough posting about this topic. Any more and I will need to open an online Li-Qua-Che store, and that would expose me to way to many questions pertaining to doll heads. Due to the Dallas Art Fair with 83 galleries, multiple lectures and a few side art events, plus posting about the art fair for Art and Seek, these last two BFS blog posts about Li-Qua-Che had to be postponed until this week. Anyway, back to fun with liquid paper mache... Size does make a difference. In our past Li-Qua-Che projects we made large tiles that had issues with de-molding, warpage and strength. In this project we scaled down the tile to 5"x 8". We also dropped the idea of incorporating open areas/holes into the design. Above is our smaller finished tile after curing over night. You can tell by the surface that it still needs some light sanding with 0000 steel wool to smooth it out. We did notice that the edges of the tile were a bit ruff. With that in mind, when designing a one piece mold, the model should be fabricated a little taller so the ragged edges can be sanded down to form a straight, smooth edge. 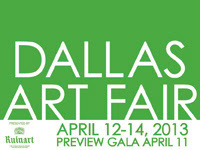 The fifth annual Dallas Art Fair is just around the corner, and with 83 galleries in this years line up, 40 of which are first time participants, I am starting to get really excited to see some new and exciting artwork. While perusing the local media coverage for this event I discovered two wonderful things which I am very excited to share with my BFS Blog subscribers. First is the new art and entertainment website CultureMap. They have been around for a while but I just found out about them. The second discovery is that CultureMap in their post Enthusiasts Experience Dallas Art Fair for Free on Professionals Day posted a pass code that allows you to purchase free tickets to the Dallas Art Fair! NOW you have no excuse to miss the most important art event in the DFW metroplex!